A veranda or verandah is a porch or long, open room with a roof over it. It can be an open area with a roof that is built around a building at the center. It usually has a line of columns or pillars holding up the roof. There is often a railing around the outside. 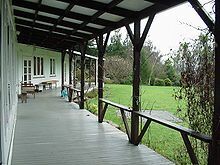 Verandahs often cover the whole front and sides of a building. The word "verandah" comes from India. Word has been modified from a Persian word 'Bar-Amada', which means a place which leads to out-side. Two words from Sanskrit were combined and changed in Bengali and then borrowed by English. "Vahir"( "বাহির" ) means "outside" and "Andar" ("অন্দর") means inside a room. It means something that is outdoors but inside a room or covered area. According to the Oxford English Dictionary, the word verandah came from India. It is found in several native languages there. However, it may have come from the Portuguese or older Spanish words varanda (baranda or barandilla in modern Spanish). But these words were also borrowed from Indian languages. Although the form "verandah" is correct and very common, some spell the word without an h (the Oxford English Dictionary gives the h version as a possible spelling, and the Guardian Style Guide says "veranda not verandah"). The veranda has been an important part of local Australian architecture. It began to become common in colonial buildings during the 1850s. The Creole Townhouse in New Orleans, Louisiana is also noted for its prominent use of verandas. ↑ Poppeliers, John C. (1983). What Style is it?. New York: John Wiley & Sons. p. 106. ISBN 0471144347. ↑ "Glossary of Anglo-Indian words - verandah". University of Chicago. Retrieved 2007-01-11. ↑ "Verandah - Discussion forum". archnet.org. Retrieved 2007-01-11. This page was last changed on 18 February 2019, at 20:11.